You can make these to go with pre-dinner drinks, for a picnic, for a party or as a supper dish. They’re great hot or cold and that makes them very versatile. 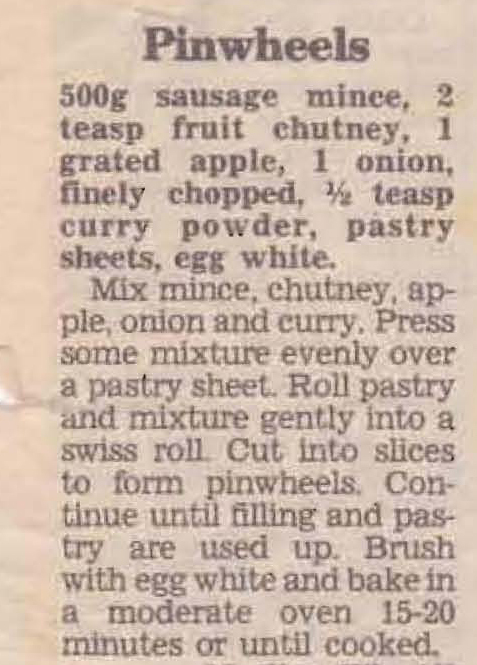 This entry was posted in All Recipes, Nibbles & Snacks and tagged 1990s, Apple, curry powder, fruit chutney, onion, pastry, pinwheels, sausage mince by bebsrecipes. Bookmark the permalink.